What was life like for those living amidst the luxury of 1920s Berlin; how did the privileged few live whilst revelling in the magnificence of the Wiemar Republic, before the Great Depression and the Nazi seizure of power? 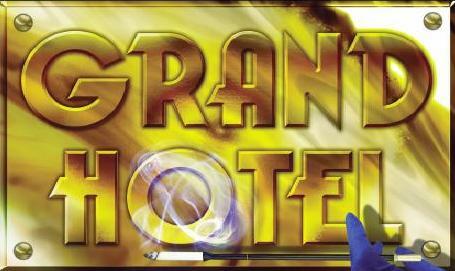 All is revealed in a new dynamic production of the musical â€œGrand Hotelâ€, staged at the Bridewell Theatre by the Stock Exchange Dramatic and Operatic Society (SEDOS). Based on the book Menshen Im Hotel, by Austrian novelist Vicki Baum, Grand Hotel follows the lives of a diverse set of characters staying at one of the most opulent hotels in the world. Directed by Andrew Overin, with choreography by Gayle Rogers and musical direction by Matthew Gould, the balance of character and dance led performance provided the production with energy and elegance. A large cast, extensive under-scoring and opening with a long sequence involving the entire cast; the three in charge did not pick an easy challenge. Nonetheless, they certainly pulled it off. Set in the hotel lobby, inclusive of a revolving door, the performance opens with a lavish sequence, establishing the show as one oozing with enthusiasm and enjoyment. Each character is wonderfully introduced by Colonel-Doctor Otternshlag (Craig Karpel) with a charming yet venomously sordid tone. And so we follow the lives of the dashing and debonair Baron Felix Von Gaigern (Angus Jacobs); the aging ballerina Elizaveta Grushinskaya (Cheryl Knight) on another farewell tour; the ambitious young Flaemmchen (Kelly Chinery) with dreams of Hollywood; the modest Otto Kringelein (James Franey) in failing health and the apparently earnest Hermann Preysing (Chris De Pury) experiencing the pressures of business. Guided through their collective foibles, tribulations, passions, failings and hardships, the production is enthralling and endearing. Jacobs’ portrayal of the Baron is charismatic with impressive depth and feeling, particularly during â€˜Love can’t happen’ and â€˜Roses at the Station’. Of equal gravitas is Franey’s â€˜Kringelein’; a tender vulnerability suppressing any justified resentments and loneliness. De Pury is convincing as both the gentlemanly family man and the depraved failed business man; chillingly so. In addition, Chinery’s â€˜Flaemmchen’ is played with a lovely vitality, particularly in the adoration of the Baron. Something the show certainly profited on is the propensity of the whole cast, not just the leads, to shine. The Telephonists were delightfully sprightly, the scullery workers injected light hearted interludes and the two Jimmy’s (energetically played by Dan Chasemore and Robin Crowley) were superbly buoyant and entertaining. Particular mention must go to Knight’s portrayal of Grushinskaya. Commanding the stage, Knight delivered a thoroughly engaging performance, able to deliver both a sense of aging pretension and sincere emotion, the delivery interspersed with the ability to make the funny lines hilarious. With the support of Raffaela, played touchingly by Susan Booth, the Grushinskaya character is certainly a favourite. Overall I very much enjoyed the performance of Grand Hotel. By the end a few questions were left unanswered, and I did feel that perhaps there was only a vague undercurrent of this Grand Hotel experience soon to be lost forever – with little feeling of the foreboding years to come. Also, a few times, there were pools of light with the performers opting to stand on the periphery. Nonetheless, this did not detract in any way from the thoroughly enjoyable nature of the piece. Grand Hotel is running in London at the Bridewell Theatre, Bride Lane, off Fleet Street, EC4Y 8EQ until Saturday 5th May. I heartily recommend taking a look. For further details, or to book tickets, go to www.sedos.org.uk.